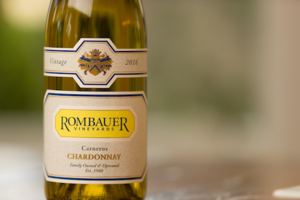 Please join us on Tuesday, September 18, 2018 at 7:00 pm for a Rombauer Vineyards Wine Dinner at Washington Prime in Georgetown, CT.
Rombauer Vineyards in the Napa Valley was established in 1980 by Koerner and Joan Rombauer. 37 years later, the winery remains a staple in the valley, owned and operated by first, second and third-generation members of the family. Joining us on Tuesday from Rombauer will be Jim Teegan, the Northeast Sales Manager for the winery. Jim has been with Rombauer since 2004 and so we're pretty excited for him to share with us his wealth of experience with these wines. For a look at the menu, see image #2.